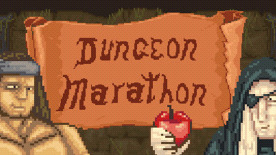 Dungeon Marathon is a new style of game where you must run through Dungeons, no fighting allowed! The Warrior, Valkyrie, Wizard and Dwarf under the belief the dungeons are a gym, must run to survive the danger that lurks in the depths. Tricked by the old hag, will they sucumb to the many temptations or sprint to destiny...Only you will decide. From Retro Army the creators and one-man team of 'Super trench attack', 'Verdict Guilty' and 'Death's Hangover' this is the latest in our budget range, and features our usual wacky humor and arcade style gameplay! Be a part of the Mararthon! © 2017 Retro Army Ltd, Co SC402831. All Rights Reserved.